This the season of Spring Break and Semana Santa. Some of you head for the hills; some stock up on supplies and hunker down; and others go out and join the fun. I stock up and hunker down for the most part. Mario goes out and joins the fun under the guise of “taking photos for the paper” (*wink*wink). If you are considering bringing your family down during this time, not to worry, it’s not all kids and debauchery – Rocky Point is very much a family friendly town and there is a ton of stuff for young families, and older families, to enjoy so don’t put off coming down. Manny’s re-opening and completely new look will surely draw crowds back to El Mirador area, which will be great. I love the remodel – the beachside pool and Monkey Swing Bar are sure to be crowd favorites. And I love that Manny’s still has the same laid-back vibe. Mom, Tom and I spent many a work-days there: We would go for breakfast and just never make it to the office…ahhh, the good old days! If you haven’t been to Manny’s yet go and check it out – you can even catch Manny, Sr. there most days. Speaking of not showing up for work…I convinced Alicia and Mario to “call in sick” one day last month and accompany myself and my besties from California, Heather and Kevin Wopershall, to have a spectacular beach day. We headed out for the miles and miles of deserted beach between Peñasco and El Golfo de Santa Clara. It was Heather’s birthday, so what better way to remember her birthday than to let them have the privilege of driving Tom’s yellow buggy. (No, we didn’t tell them it was called the Lemon Buggy and that it always breaks down – what fun would that be?) Those of you who are not familiar with the buggy’s track record, it makes it home under its own power less than 50% of the time…and that might be very generous! A half-hour passes…Then an hour…then one and a half hours. Mario and Alicia looked at me and we all agreed we had better go look for them. It was still a few hours before sunset and I figured they had gotten the buggy stuck in the dunes or, worst case, had gotten lost and we’d find their tracks and then find them. Well, Mario did find their tracks about a mile or so from our “camp”. It looked like they had followed the flow of the ocean back up into a “mini estuary” draining spot. We started to follow the tracks and it started getting really mucky, so we parked, set off on foot and walked until Mario saw that the buggy tracks had gone back toward beach. So, back up the beach we headed. We ended up finding them a few miles up the beach…turns out they had stopped to take care of “business” and, in keeping with tradition, the Lemon Buggy wouldn’t start. So, there they had been walking around on the beach for almost 2 hours waiting for us to pack it in and come find them. The guys tried to fix it, but no luck. Where is Robert Lee when you need him ☹? The Lemon Buggy was, once again, towed home and it is surely a ride Kevin will not soon forget…we towed Mexican style!! I think the damage ended up being a failed fuel pump – not to mention the entire brake system was a rusted mess. Three vehicles set out, but only two made it home (under our own power), but we still had one hell of a fantastic day! 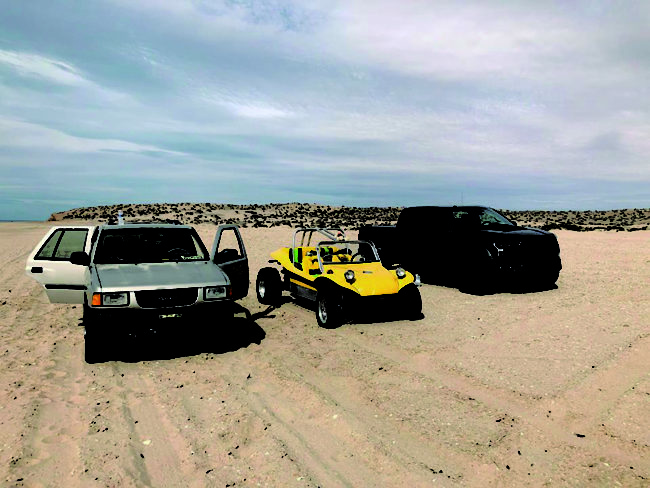 And now we have to talk about the El Golfo Run – a 4×4 trip from Rocky Point to El Golfo de Santa Clara that the Rocky Point Times (my Mom, Sandra O’Hare) organized every May and October. Alicia and Mario would like to have a Memorial Run this May for my Mother, Sandra O’Hare, who passed away last June, and it seems everyone is just waiting for me to say yes. It is a lot of work (and a giant headache) organizing the Runs and my Mom was amazing at it. I did not inherit that gene or her enthusiasm, but a Memorial Run in celebration of her life and hard work on all of the El Golfo Runs would be very nice. So how about we start with this…everyone interested in going on the Run in May contact Alicia at the office and let her know that you want to go and tell her which you prefer – going during the week (ex: Tues, Wed, Thurs, or Wed, Thurs, Fri) or on the weekend (Fri, Sat, Sun or Sat, Sun, Mon). We can then see how many are interested in going and when and then we will choose dates and go from there. I have to give a shout out for Laguna Shores Resort’s new restaurant – and not just because I live there – at the resort, not the restaurant haha. They had a wine tasting event and pairing dinner last month and it was fantastic. They held the wine tasting upstairs of their new restaurant on the top deck outdoor patio. The tasting featured some 15+ wines from Valle de Guadalupe and was a mere $20. After that they had a wine pairing five-course dinner which featured various wines from Mexico. It was limited to 20 people and only $40 and there was a long waiting list. You can bet no one cancelled at that price and with the delicious menu prepared by their new Executive Chef Tony Acuña. Tony was embarrassed that he had to turn people away, but he promises a bigger and better one once the restaurant opens officially in March. I was given the grand tour from Michael Kline, General Manager of Laguna Shores Resort and Chef Acuña, and it is absolutely beautiful. They leveled the old palapa restaurant, Mikky’s and created a masterpiece, which only be outshined by Chef’s Tony imaginative dishes. I can’t wait for the Grand Opening and am more excited with the pairing dinners that he will be hosting regularly. We’ll definitely keep you apprised of the developments. 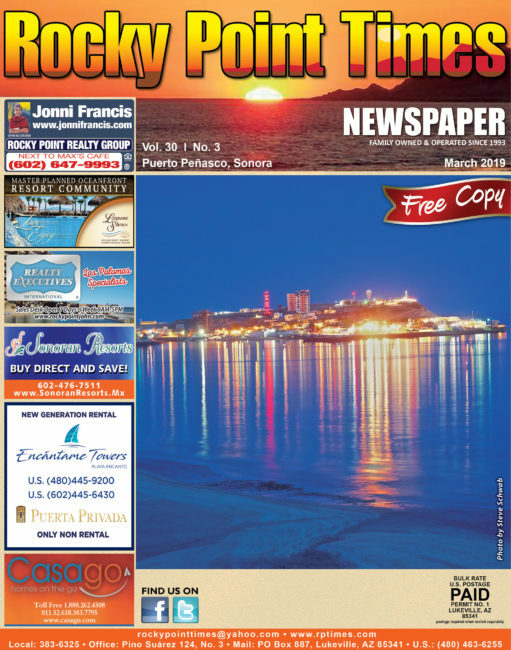 I hope you all read The Old Gringo’s article last month about Rocky Point’s Treasure being its people. How true that was and is. I’ve had many encounters just like his over my 23+ years down here. In fact, not too long ago, I hit a big chunk of concrete and slashed the sidewall of my tire trying to maneuver out of a parking spot others had pinned me into. I didn’t even realize my tire had been slashed until this guy from the park came running over to help me. He helped me for well over an hour – in the middle of hot and sweaty August – and did not give up until he had changed my tire for me. I’ve been stuck on Hwy. 8 in the middle of summer and in Caborca and around town and someone has always stopped to help me. And I try to return the favor as well. It was a great article that deserves a read. On a final note I would like to say GET WELL SOON to Jennifer Corcoran (my husband Wayne’s daughter – technically my step-daughter, but I can never say it out loud because that means I also have grandchildren LOL) – she had brain surgery last month to remove a tumor and Wayne has been in Canada, by her side, offering support for her and her family. Please keep them in your thoughts. Everyone has a very safe and wonderful Spring Break.